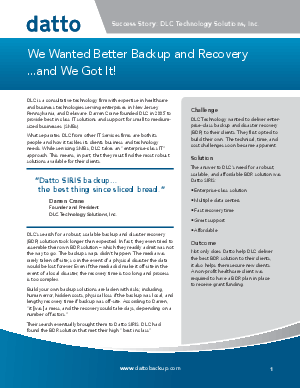 DLC Technology needed a better BDR and business continuity solution for their clients. The answer was not in building their own BDR, which they tried, but with Datto SIRIS. Learn how Datto’s robust BDR and business continuity solutions helped them achieve HIPAA Security Act compliance, fast recovery times, and more.